Serum amyloid P component (SAP), a member of the pentraxin protein family, is mainly secreted from the liver and macrophages into the circulation [1, 2]. SAP is a soluble pattern recognition receptor of the innate immune system. The unique binding activities of SAP suggest that it may localize specifically to sites of injury and function to aid in the removal of damaged tissue . The recent discovery of its ability to regulate certain monocyte differentiation states has identified SAP as a novel and potentially powerful antifibrotic agent . A fully recombinant form of the human PTX2 protein (designated PRM-151, a paralog of SAP protein) was examined in human clinical trials . Vascular fibrosis is linked to many clinical diseases and pathological progresses including atherosclerosis. SAP is known to affect macrophage activation through Fcγ receptors [6, 7]. 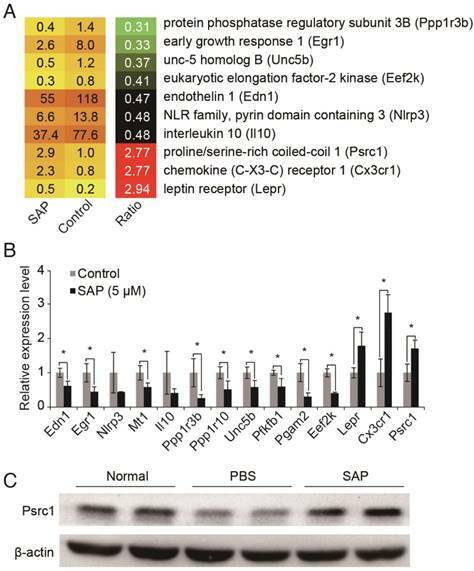 Functional analysis demonstrates that SAP associated with high density lipoprotein (HDL) promotes scavenger receptor class B type Ⅰ (SR-BⅠ)-dependent cholesterol efflux and lipid-free SAP enhances ATP-binding cassette transporter A1 (ABCA1)-dependent cholesterol efflux, suggesting that SAP may play a role in cholesterol removal from cells [8, 9]. However, the precise role of SAP in HDL function and progression of atherosclerosis remains elusive. A hallmark of atherosclerosis is the formation of macrophage-derived foam cells . CD68 is exploited as a valuable marker for macrophages in histochemical analysis . It has been accepted that increased uptake of oxidized low-density lipoprotein (ox-LDL) and/or reduced cholesterol efflux leads to the deposition of esterified cholesterol in the cytoplasm of macrophages and promotes the generation of foam cells. Reverse cholesterol transport (RCT) describes the transport of cholesterol from peripheral tissues (including atherosclerotic plaque) into the liver for recycling or excretion in bile, and includes cholesterol removal in the liver and cholesterol efflux in peripheral tissue. Cholesterol efflux transport proteins in peripheral tissue are expressed in macrophages, and cholesterol efflux from macrophages is the first step in RCT. The RCT process can reduce cholesterol deposition in the blood vessel wall, thereby preventing the occurrence of atherosclerosis. Cholesterol efflux capacity quantifies total efflux mediated by pathways of known relevance in cholesterol efflux from macrophages, such as ATP-binding cassette transporter A1 (ABCA1), ATP-binding cassette transporter G1 (ABCG1) and scavenger receptor B1 (SR-B1). Macrophages respond to excessive lipid accumulation mainly through lipid efflux that is mediated by ATP-binding cassette (ABC) transporters ABCA1 and ABCG1 and by SR-BI . Both ABCA1 and ABCG1 genes are directly regulated by LXRs and it is widely assumed that the athero-protective effects of synthetic LXR agonists are due to the increased macrophage cholesterol efflux via the up-regulation of ABCA1 and ABCG1 genes [13, 14]. Peroxisome proliferator-activated receptor gamma (PPAR-γ) has been implicated in the pathology of atherosclerosis and agonists have been used in the treatment of hyperlipidaemia and hyperglycemia. PPAR-γ activates the Pon1 gene, increasing synthesis and release of paraoxonase 1 from the liver, reducing atherosclerosis . Dysregulation of lipid homeostasis in macrophages due to disruptions in any of these aspects leads to foam cell formation and eventually, the progression of atherosclerosis . In the present study, using Apoe-/- mice we showed that SAP treatment attenuates atherosclerosis via its effects on macrophages. Through bioinformatic analysis followed by experimental validation, we demonstrated that proline/serine-rich coiled-coil protein 1 (Psrc1) is an important downstream effector of SAP in macrophages. Our findings reveal an anti-atherosclerotic role of SAP and extend the current knowledge regarding this molecule as a marker for atherosclerosis. Apoe-/- mice with C57BL/6 background were obtained from Vital River Laboratory Animal Technology Corporation (Beijing, China). Regular chow and high-fat diet were purchased from Guangdong Medical Lab Animal Center (Foshan, Guangdong, China). Twelve 8-week-old male C57BL6 mice were fed chow diet as the normal group. Twenty-four 8-week-old male Apoe-/- mice were fed the high-fat diet. At the 12th week of experiment, the Apoe-/- mice were randomly divided into two groups: PBS group and SAP group. The mice in the SAP group were given intraperitoneal injections of SAP (6 mg/kg) every other day for a total of 2 weeks [17-19]. We estimated that the dose level of 6 mg/kg SAP was approximately 3-fold of the predicted endogenous SAP level . The mice in the normal and PBS groups were injected with PBS of the same volume. The normal group was continually fed the chow diet while the PBS and SAP group were fed the high-fat diet until the 16th week. All animal experiments were approved by the Animal Care and Utilization Committee of the Southern Medical University. The aorta was separated with a general microscope from the start of the ascending aorta to the common iliac artery aortic bifurcation. Aortic roots were immediately stored at -80 °C to produce frozen sections for Oil Red O staining, or fixed in 4% paraformaldehyde to make paraffin sections for hematoxylin-eosin (HE) staining and immunohistochemical analysis. Immunohistochemistry was performed as described previously [21, 22]. Briefly, sections were incubated with anti-SAP (PAB539Mu01, Cloud-clone corp., USA), anti-CD68 (ab955, Abcam Inc., UK), or normal goat IgG in 10% horse serum overnight at 4 °C. After washing in PBS, the sections were incubated with biotinylated secondary antibody followed by an avidin-alkaline phosphatase complex and Vector Red according to the manufacturer's protocol (DAB kit; ZLI-9017, ZSGB-BIO, China). The signal was visualized as a brown color. The murine macrophage cell line RAW264.7 was obtained from China Center for Type Culture Collection (GDC143, CCTCC, Wuhan, China). Human serum amyloid P-component (SAP) was purchased from Calbiochem (565190-500UGCN, Calbiochem, EMD Chemicals, MA, USA). SAP was frozen in PBS without the sodium azide preservative. Before the experiment, the cells were synchronized by changing DMEM (10099141, Gibco, Life Technologies, China) supplemented with 2% bovine serum albumin (9048-46-8, BSA, Amresco, USA) for 24 h. BSA served as the control. RAW264.7 cells were transfected at 70-80% confluency with Psrc1 siRNA at 100 nM or scrambled control siRNA, respectively. The effectiveness of the siRNA treatment was assessed by measuring Psrc1 mRNA levels with quantitative RT-PCR analysis. Murine RAW264.7 macrophage cells were incubated in culture medium containing 30 μg/mL ox-LDL (Yiyuan Biotechnologies, Guangzhou, China) and 1 μCi/mL [1α,2α-3H]-cholesterol (Amersham Life Science, USA) for 24 h. After washing with serum-free medium, the cells were incubated in DMEM with 0.2% BSA containing various concentrations of SAP (0-10 μM, 1 μM SAP = 25 μg/mL of SAP monomer) for 6 h, 24 h, 48 h, respectively. In the animal experiment, efflux mediums containing 2.8% serum from mice precipitated with dextran sulfate were added for 4 h. Subsequently, cells were incubated in serum-free medium (without BSA) with or without 10 μg/mL apoAI (Calbiochem, Germany) for 6 h. Then the incubation medium was collected while the cells were washed with PBS and lysed with 0.1 M NaOH. Lastly, the radioactivity of the medium and cell lysates was measured by liquid scintillation spectrometry. The cholesterol efflux rate was presented as medium 3H-cholesterolradioactivity normalized against the total 3H-cholesterol radioactivity . At the end of the experiment, the concentrations of serum total cholesterol (TC), triglyceride (TG), high-density lipoprotein cholesterol (HDL-C) and low-density lipoprotein cholesterol (LDL-C) were measured with an automated biochemical analyzer (Type AU5421, Olympus, Japan). Serum Paraoxonase1 (PON1) activity was detected with Phenyl acetate as the substrate. Serum PON1 activity was assayed according to the method of Beltowski et al. using the synthetic substrate phenylacetate (Nacalai Tesque, Kyoto, Japan). PON1 activity was determined by measuring the initial rate of hydrolysis at 270 nm of phenylacetate in buffer solution with sample serum added to the reaction mix. The cell-free assay was a modification of a previously published method using 1-palmitoyl-2-(5,6-epoxyisoprostane E(2))-sn-glycero-3-phosphocholine (PEIPC) as the fluorescence-inducing agent . Briefly, HDL was isolated by the dextran sulfate method. To determine the inflammatory/anti-inflammatory properties of HDL, the change in fluorescence intensity as a result of the oxidation of 2,7-dichlorodihydrofluorescein diacetate (DCFH) by PEIPC in the absence or presence of the test HDL was used. DCFH-DA was dissolved in fresh methanol at 2.0 mg/mL and was incubated at room temperature in dark for 30 min, resulting in the release of DCFH. PEIPC solution (10 mL) and 90 mL of HDL-containing dextran sulfate supernatant were divided into black 96-well polystyrene microtiter plates (Corning, USA) and incubated at 37 °C on a rotator for 1 h. 10 mL DCFH solution was added to each well, mixed and incubated for an additional 2 h at 37 °C with rotation. Fluorescence intensity was determined using a fluorescence plate reader (SpectraMax M5 plate reader, Molecular Devices) set at an excitation wavelength of 485 nm, emission wavelength of 530 nm, and cutoff of 515 nm. Values in the absence of HDL were normalized to 1.0. In this assay, values >1.0 after the addition of the test HDL indicated pro-inflammatory HDL, whereas values <1.0 indicated anti-inflammatory HDL. Cells were harvested, washed with PBS, lysed for 30 min in an ice bath, and centrifuged (15 min at 14,000 × g and 4 °C). Half of the resultant supernatant was applied to an 8% gel for SDS-PAGE and the other half was applied to a 10% gel. Following electrophoresis, the gels were transferred to polyvinyl fluoride membranes. The membranes were blocked with 5% milk and then probed overnight with protein-specific Abs. Finally, the membranes were incubated with an HRP-conjugated secondary Ab (Protein Tech Group, Chicago, IL) and detected using an ECL Western blotting detection kit (Sigma-Aldrich). Protein band intensity was measured using ImageJ software (National Institutes of Health). The total RNA was extracted with RNAiso Plus (TaKaRa Biotechnology, Dalian, China). Reverse transcription was performed at 37 °C for 15 min followed by 98 °C for 5 min using ReverTra Ace qPCR RT Kit (Toyobo, Osaka, Japan). Quantitative PCR was performed using THUNDERBIRD SYBR qPCR Mix (Toyobo, Osaka, Japan) on the Applied Biosystems 7500 (Life Technologies). The program was as follows: 95 °C for 60 s, followed by 40 cycles of 95 °C for 15 s and 60 °C for 45 s. All reactions were run in triplicate. The β-actin gene was amplified as a reference gene for normalization. Data were analyzed using 2-ΔΔCt method. Primer sequences used in this study are listed in Table S1. The data are presented as the mean ± standard error of the mean (SEM). One-way analysis of variance followed by Bonferroni's post hoc test was applied for comparisons between multiple experimental groups. Unpaired Student's t-test was used to compare two groups with a normal distribution. P values of <0.05 were considered to be statistically significant. For the analysis of cholesterol efflux capacity, group sizes were determined by an a priori power analysis for a 2-tailed, 2-sample t-test with an α of 0.05 and power of 0.8. SPSS version 22.0 was used for all analyses. 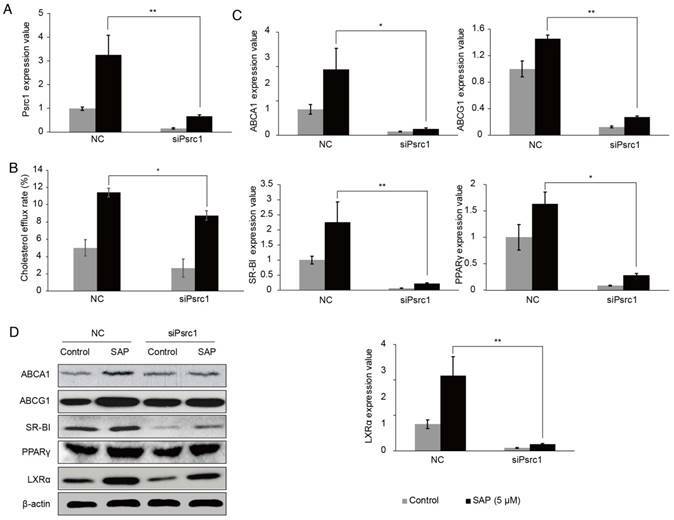 To clarify the effect of SAP on the progress of atherosclerosis in vivo, Apoe-/- mice were fed a high-fat diet for 4 weeks and then treated with SAP (Figure 1A). The aortic lesion assay demonstrated a remarkable reduction in atherosclerotic plaque area in SAP-treated Apoe-/- mice by oil-red O staining (Figure 1B). Serial sections of the aortic root also showed that the lesion area in SAP-treated mice was significantly reduced during the development of atherosclerosis (Figure 1C). SAP immunostaining of aortic roots of Apoe-/- mice treated with SAP confirmed that SAP was up-taken by the lesion area (Figure 1D). Collectively, these results indicate that SAP treatment alleviates atherosclerosis development in Apoe-/- mice. The levels of serum TC, TG and LDL-C in Apoe-/- mice were significantly increased compared with the the normal group, whereas serum HDL-C was decreased. However, no statistically significant difference was observed between the PBS group and the SAP group in Apoe-/- mice (Figure 2A). Then, we obtained serum from the normal group, PBS group and SAP group. The serum was used to treat RAW264.7 macrophage cells. Compared with the PBS group, serum from the SAP group markedly increased cholesterol efflux rate (Figure 2B) and PON1 activity (Figure 2C). Meanwhile, HII was decreased (Figure 2D). 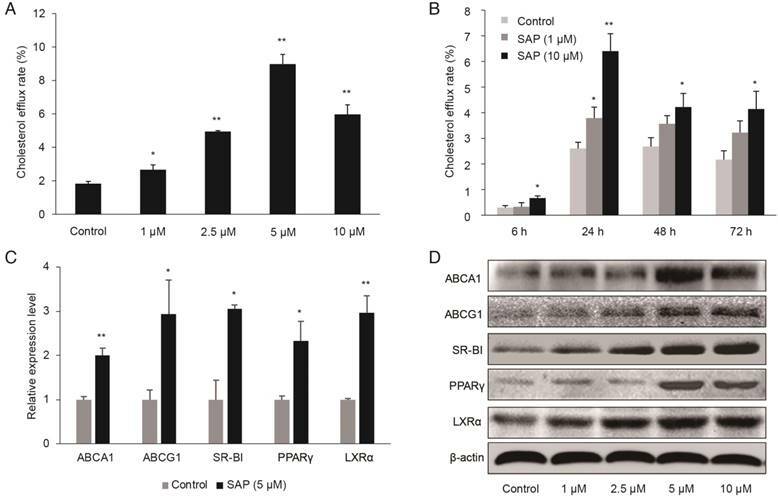 Data of the expression of cholesterol efflux proteins showed that ABCA1, ABCG1, SR-BI, PPAR-γ and LXR-α protein were higher in the SAP group compared with the PBS group (Figure 2E). We established an in vitro model using cultured RAW264.7 macrophage cells. We found that SAP enhanced apoA1-mediated cholesterol efflux in a time- and concentration-dependent manner (Figure 3A-B). The cholesterol efflux rate significantly increased at 5 μM after 24 h treatment. Additionally, the expression of cholesterol efflux proteins, ABCA1, ABCG1 SR-BI, PPAR-γ and LXR-α, were higher upon SAP treatment, as revealed by qRT-PCR and Western blot (Figure 3C-D). To investigate the molecular mechanisms underlying SAP function in macrophages, we analyzed the RNA sequencing (RNA-seq) data from RAW264.7 macrophage cells treated with SAP for 24 h . Differentially expressed genes were identified according to their fold changes (>2) and false discovery rate (<0.05). Compared to control, 134 genes were down-regulated and 41 genes were up-regulated after SAP treatment (Table S2). Next, we sought to dissect genes with a known role in atherosclerosis (AS). Because the pathogenesis process of AS is not available in public bioinformatics databases, we conducted a systematic and comprehensive literature search of all 175 differentially expressed genes in the PubMed database without language or publication date restrictions. Official gene symbols were searched as well as previous symbols and synonyms as listed by Entrez Gene Database. After scrutinizing titles and abstracts, we downloaded relevant publications and checked whether there was a clear relationship between the differentially expressed gene and AS. In this way, we identified 10 genes that were known to play a role in AS (Figure 4A). Their expression pattern was confirmed by using qRT-PCR (Figure 4B). Finally, we focused on the Psrc1 gene. Genetic variants near PSRC1 are also associated with serum LDL cholesterol level [27-31] and statin treatment efficacy [32-34]. Therefore, we suspected that PSRC1 may be a key downstream effector of SAP in macrophages. We confirmed that the protein level of Psrc1 gene is up-regulated upon SAP treatment in Apoe-/- mice (Figure 4C). By silencing the Psrc1 expression in RAW264.7 cells (Figure 5A), the cholesterol efflux rate was decreased (Figure 5B). We tested the expression of lipid transport-related proteins using qRT-PCR. The results showed that ABCA1, ABCG1, SR-BI, PPAR-γ, LXR-α expressions were lower when Prsc1 was knocked down using siRNA and raised after SAP treatment (Figure 5C). These results were confirmed at the protein level using Western blot (Figure 5D). Taken together, these results indicate that Prsc1 mediates at least in part the effect of SAP in macrophage cells. The effect of SAP treatment on atherosclerotic development in Apoe-/- mice. (A) A diagram of the experimental design. (B) Staining of the aortic tree (upper panel) and quantification of positive area (lower panel, mean ± SEM, n = 6). (C) Oil Red O staining of the aortic roots (upper panel) and quantification of the lesion area (lower panel). (D) CD68 and SAP immunostaining of aortic roots of Apoe-/- mice treated with SAP. Quantification of CD68-positive staining area as well as SAP-positive staining area are shown in the right panel. Data are shown as mean ± SEM. Altered HDL function in Apoe-/- mice. (A) The serum lipid profiles. HDL-C, high-density lipoprotein cholesterol; LDL-C, low-density lipoprotein cholesterol; TC, total cholesterol; TG, triglyceride. (B) The quantification results of lipoprotein cholesterol efflux capacity. (C) The quantification results of paraoxonase-1 (PON1) activity. (D) The quantification results of HDL inflammatory index (HII). All parameters were screened using 6 mice randomly selected in each group. for the analysis of cholesterol efflux capacity, all 12 mice in each group were used to ensure a statistical power of more than 0.8. (E) The expression of lipid transport-related proteins in RAW264.7 cells treated with serum from Apoe-/- mice. Western blot was repeated 3 times and a representative image is shown. The mean values of quantified data are labeled on the right. The role of SAP in macrophages. RAW264.7 cells were treated with different concentrations of SAP. (A) The effect of different concentration of SAP on cholesterol efflux rate in RAW264.7 cells after 24 h treatment (mean ± SEM, n = 4). (B) The effect of SAP on cholesterol efflux rate in RAW264.7 cells across various time points (mean ± SEM, n = 4). *, p < 0.05; **, p < 0.01. (C) The expression of lipid transport-related genes in RAW264.7 cells after SAP treatment for 24 h assessed by qRT-PCR analysis of. (D) Western blot analysis of lipid transport-related genes. Serum amyloid P component (SAP) is a member of the pentraxin family, which originates in early invertebrates. These proteins have evolved with the innate and adaptive immune systems, interacting with the ancient complement system and the Fcγ receptors. SAP also plays a significant role in important biological processes in the cardiovascular system, such as fibrosis, coagulation and inflammation. Serum concentration of SAP in normal humans is about 30-40 μg/mL. Previous studies indicated that SAP does not exist in normal aortic intima but exists in human atherosclerotic aortic intima and that plasma SAP levels are positively associated with cardiovascular disease in the elderly . Our previous studies have shown that a significant increase in serum SAP levels was observed in ACS patients relative to controls . These findings indicate that SAP may serve as a marker of atherosclerotic development and/or progression underlying angina and MI. In healthy mice, normal SAP levels may be as low as 25 μg/mL in the C57BL strain . 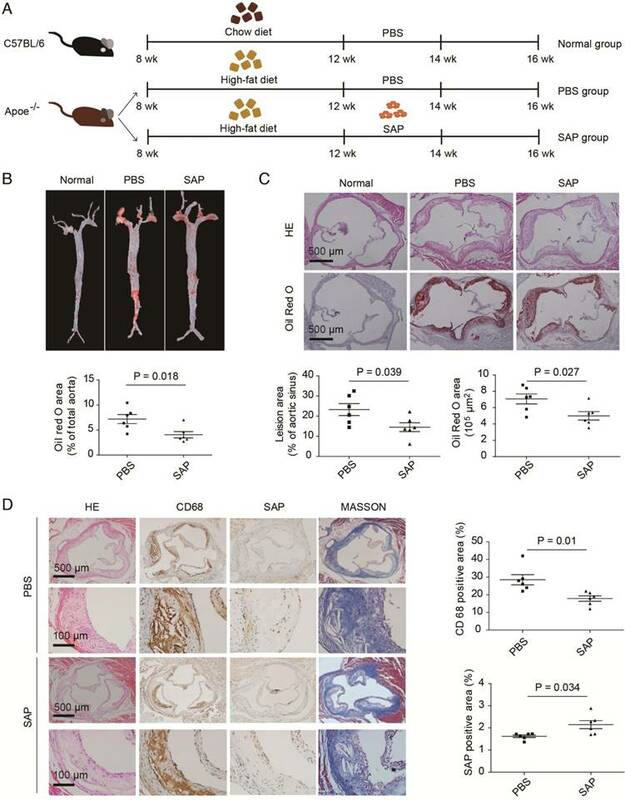 In this study, we found that after Apoe-/- mice were treated by intraperitoneal injection of SAP (6 mg/kg), the atherosclerosis plaque area in SAP-treated mice was significantly reduced. RAW264.7 mouse macrophages were used to determine the mechanisms. In cell experiments, we chose 1 μM to represent a physiological situation. Higher concentrations up to 10 μM were used to mimic the acute phase reaction. SAP is generally recognized as a natural antifibrotic agent . Since vascular fibrosis contributes to atherosclerosis, SAP may exhibit a beneficial effect on atherosclerosis. However, clinical trials have revealed that in elderly men and women, circulating SAP is associated with CVD risk, subclinical CVD and incident angina, and myocardial infarction (MI) . In vitro studies have shown that SAP accelerates the formation of amyloid fibrils and strongly inhibits phagocytosis of apoC-II amyloid fibrils by primary macrophages . Moreover, SAP can be generated in atherosclerotic lesions by macrophages and smooth muscle cells in neointima . To clarify the effect of SAP on the progress of atherosclerosis in vivo, Apoe-/- mice were treated with SAP (6 mg/kg, every other day for 2 weeks). We found that the aortic lesion assay demonstrated a remarkable reduction in atherosclerotic plaque area in SAP-treated Apoe-/- mice. In SAP-treated mice, although serum SAP level was not elevated significantly, SAP immunostaining analysis confirmed that SAP was up-taken by the lesion area. Our results confirm that SAP plays a protective role in AS. Identification of SAP downstream target genes. (A) Transcriptome analysis revealed 10 AS-related genes were differentially expressed upon SAP treatment. (B) Validation of gene expression by using qRT-PCR. (C) Western blot analysis of Psrc1 expression in vivo. Atherosclerosis is a peculiar form of inflammation triggered by cholesterol-rich lipoproteins and other noxious factors. This disease is a syndrome affecting arterial blood vessels due to a chronic inflammatory response in the walls of arteries. Macrophages are the most abundant inflammatory cell type in atherosclerotic plaques. These types of cells are transformed into foam cells upon modification by low density lipoprotein uptake, and their subsequent death within lesions fuels the formation of the highly proinflammatory and thrombogenic lipid-rich necrotic core [38, 39]. Our study found that the levels of serum TC, TG and LDL-C in SAP-treated Apoe-/- mice were significantly increased compared with control, whereas serum HDL-C was decreased. However, no statistically significant differences were observed between the PBS group and the SAP group. Compared with control, SAP-treated Apoe-/- mice had a markedly increased cholesterol efflux rate and PON1 activity. Meanwhile, high-density lipoprotein inflammatory index (HII) was decreased. We next evaluated the expression of cholesterol efflux proteins. The results showed that ABCA1, ABCG1, SR-BI, PPAR-γ and LXR-α proteins were higher in SAP-treated Apoe-/- mice. We also found that SAP enhanced apoA1-mediated cholesterol efflux in a time- and concentration-dependent manner. The cholesterol efflux rate was significantly increased at 5 μM after 24 h treatment. Similar to the in vivo results, the expression of cholesterol efflux proteins, ABCA1, ABCG1, SR-BI, PPAR-γ and LXR-α were higher upon SAP treatment, as revealed by qRT-PCR and Western blot. These results indicate that SAP may play an important role in cholesterol efflux of macrophages. To investigate the downstream effectors of SAP function in macrophages, we analyzed RNA-seq data from RAW264.7 macrophage cells treated with SAP for 24 h. We identified a total of 175 differentially expressed genes, of which 134 genes were down-regulated and 41 were up-regulated. Through a literature search, we found that 10 of these differentially expressed genes were known to play a role in AS. Finally, we focused on the proline and serine rich coiled-coil 1 (Psrc1) gene. Psrc1 is essential for mitotic progression by regulating spindle dynamics. SNP rs599839 in the 3'-UTR region of the PSRC1 gene is significantly associated with moyamoya and atherosclerotic disease in Europeans . Genetic variants near PSRC1 are also associated with serum LDL cholesterol level [27-31] and statin treatment efficacy [32-34]. In addition to AS, PSRC1 is a susceptibility locus for myocardial infarction [41-43] and coronary heart disease [44-46]. Therefore, we suspected that PSRC1 may be a key downstream effector of SAP in macrophages. By screening 3 siRNAs, we found a siRNA that could significantly reduce Prsc1 expression in RAW264.7 macrophage cells. Macrophage cholesterol efflux was reduced when Psrc1 was silenced in RAW264.7 macrophages. We tested the expression of lipid transport-related proteins using qRT-PCR. The results showed that ABCA1, ABCG1, SR-BI, PPAR-γ and LXR-α expressions were lower when Prsc1 was knocked down using siRNA. These results were confirmed at the protein level using Western blot. Taken together, these results indicate that Prsc1 mediates at least in part the effect of SAP in macrophage cells. In conclusion, we found that SAP treatment attenuates atherosclerosis in Apoe-/- mice. We further demonstrated that Psrc1 is a downstream effector of SAP function in macrophages. Our findings suggest SAP is a promising therapeutic target for preventing the progression of atherosclerotic vascular disease. The involvement of Psrc1 in SAP signaling in RAW264.7 cells. (A) RAW264.7 cells were transfected with siPsrc1. The transfection efficacy was measured by qRT-PCR. (B) The change of cholesterol efflux rate after siPsrc1 transfection. (C) The expression of lipid transport-related genes was tested by qRT-PCR. (D) Western blot analysis of lipid transport-related genes. ABC: ATP-binding cassette; ABCA1: ATP-binding cassette transporter A1; ABCG1: ATP-binding cassette transporter G1; AS: atherosclerosis; CVD: coronary vascular disease; DCFH: 2,7-dichlorodihydrofluorescein diacetate; HDL: high density lipoprotein; HII: high-density lipoprotein inflammatory index; LDL-C: low-density lipoprotein cholesterol; MI: myocardial infarction; ox-LDL: oxidized low-density lipoprotein; PEIPC: 1-palmitoyl-2-(5,6-epoxyisoprostane E(2))-sn-glycero-3-phosphocholine; PON1: serum paraoxonase1; PPAR-γ: Peroxisome proliferator-activated receptor gamma; Psrc1: proline/serine-rich coiled-coil protein 1; RCT: Reverse cholesterol transport; RNA-seq: RNA sequencing; SAP: Serum amyloid P component; SEM: standard error of the mean; SR-BⅠ: scavenger receptor class B type Ⅰ; TC: total cholesterol; TG: triglyceride. This work was supported by National Natural Science Foundation of China (81370380), Natural Science Foundation of Guangdong Province of China (S2013010014739), the Innovative Foundation of Guangdong Province of China (2014KZDXM020) and the Science and Technology Foundation of Guangzhou City of China (201510010090). Major Scientific Research Foundation of Guangdong University (2016KZDXM016), Clinical Training Foundation of Southern Medical University (LC2016PY002). The sponsors had no role in the study design, data collection and analysis, our decision to publish, or the preparation of the manuscript.